In our fifth-grade class, students learn to craft formal academic essays. During class, the teacher guides students through the entire academic writing process: brainstorming, questioning, researching, writing, revising, and rewriting. Students are given frequent opportunities to practice each component of essay writing, including common problem areas like research and quotation. Students use their Essay Voyage writing textbook as they explore this style of writing. Additionally, students review foundational grammar concepts in greater depth and learn new vocabulary words. The grammar instruction is divided into four quarters: parts of speech, parts of a sentence, phrases, and clauses. The goal of these lessons is to improve students’ writing mechanics for implementation in their formal academic writing. Complete a warm-up activity that is tied to the day’s objectives. Practice writing skills relevant to ongoing academic writing projects. Study and apply grammar concepts using the Grammar Voyage textbook. Learn new vocabulary words using the Caesar’s English II textbook. Students should expect to spend 60-90 minutes on homework each week. Throughout the year, students work on several multi-week writing projects. Most weeks, students are expected to complete part of a project at home. It is crucial that students keep up with this process work and come prepared for class each week. Each week, students also have some reading in their grammar text, Grammar Voyage, and writing text, Essay Voyage: doing this reading at home frees up class time for practicing and receiving feedback. While it is not officially assigned, students should also plan to review their vocabulary words between classes using their Caesar’s English II vocabulary textbook. Students create vocabulary four squares for each word they study. In addition, there are regular cumulative vocabulary homework quizzes on the course homepage. Students should answer these without looking at their textbooks. Finally, students are expected to read independently throughout the year, selecting books from the Grades 4-5 Recommended Reading list. 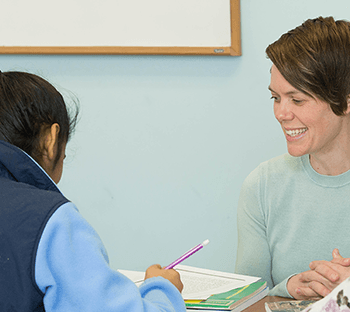 Since students complete most of their writing in class, there are many opportunities for the teacher to provide informal feedback face-to-face while students are working. The teacher conferences with students regularly during class, providing oral feedback and some informal written notes on their work. At the end of each multi-week project, students submit their final drafts and receive detailed, formal written feedback from their teacher.